How long have you’ve been Bartending? 5 and 1/2 years. And Flair Bartending? 5 years. Where do you work? I have two jobs right now, I work in Kahunaville Party Bar Inside the Treasure Island Hotel & Casino and also at Oracle Nightclub. What got you into Flair Bartending? Well when I got out from High School I didn’t know what to do with my life and my mother as any other was asking me over and over what I was thinking in doing with my life. So for some reason I went out with friends that night and we went to a new opening of a hotel in town. As soon we got there we hit the bar and the first thing I saw is this guy spinning Flairco Bottle in his hand and throwing it behind his back and all that stuff. So as soon I got home I woke up my mother and told her what I want to do for a living and she asked me “Your whole entire family are alcoholics and you want to be a bartender?”. I laughed but the next morning she found me a school where I started learning how to bartend. The first half of my first semester they bring these guys to give us a seminar of Flair and mixology together… I fell in love with it… ‘forget it’!! How did you start out learning to Flair? I exchange numbers with the guys that gave me the seminar on Flair in the institute and I pretty much wake him up every day for a year so he can borrow me his practice area and as well teach me new stuff. Tell us about the Flair Bartending scene in Las Vegas? OMG! It’s awesome! I’m really happy that I moved in such a perfect time to meet soo many people. Most of them aren’t here now and returned to their original countries but it was great meeting all of them. Still we have some great Flair bartenders in the city and it keeps getting better every year. Thank god this year we had about 4 events in las vegas so I can’t tell you how happy I am that everything is getting back again, Especially when everyone is soo nice and friendly all the time… and of course don’t forget the matter of fact that new Flairbar’s are all ways opening and mixology bars as well this help us out to combine the two worlds more. What makes you stand out from other Flair Bartenders? First I will say my Passion for it… It’s too much love involved. Second my Charisma… and finally my discipline. What do you hope to get out of Flair? Work for some spirits company!! Rum if you ask me, which is my point of interest. What is your favorite Flair Bartending competition and why? I.B.A. World Cocktail Competition. Combining the two worlds in one stage, I love it. That’s how it should be in my opinion, I always got told that the Flair bartender is the super bartender and is beyond the mixologist or liquid chef… but honestly most of the Flair bartenders I know and I’m talking more than 50% of them, they don’t practice Flair and mixology together. That’s why every time I can go to the world finals of the I.B.A. I will! Because you see so many nice things and meet so many nice people that it’s hard to say no… lol! Tell us about your experience in IBA competitions? It’s Amazing! Every time I go there its big time fun and all the seminars that you get, the chance to get it is great, you learn so much. They have a good organization and they need to fix some details but nothing that can not be fixed in any moment. Now 2013 I’m going to prepare myself to make it to the finals of the WCC in Prague. I mean I have to win the nationals in Puerto Rico first . Tell us how you trained and prepared to help you win Puerto Rico IBA Nationals four times in a row?It’s really hard, especially the last one when I made the 4 in a row which no one has ever done before and its a record in the association as well. I was soo nervous you couldn’t imagine and not to mention that event when I won I just got off from the airplane at 12:30pm and the event was at 2:00pm. I was so exhausted because of the flight but I still made it happened. To be honest, its a big goal making that happen. How do I prepare myself? well… around 6 to 8 hours a day practicing routine all the time and making sure the routine is as clean as I want it. What are the differences between IBA comps and FBA comps? I.B.A. is Mixology & Flair which their scoring system is based in 60% Flair and 40% Mixology. The mixology category they evaluate taste, color, aroma and garnish. Don’t forget the 1oz in the exhibition Flair bottle plus most of the year you compete with around 40 competitors around the world and each one of them are National’s Champions in their respective countries. Now the FBA is just a Flair scoring system with usually two simple cocktail procedures and an open entrance competition which for sometime they support Flair in a big way and put together some of the best Flair competitions in the world and help many people to accomplish their dreams. Who do you look up to in this Sport? Hard Question… Well I will always have my favorite Flair bartender which is one of my good friends Christian Delpech, But honestly I have so many people that I look up to for this profession like Jorge Lopez: He is the President of the Puerto Rico Bartenders Association and as well one of my best friends and he is the one that helps me big time to get involved in this profession and every time I have any kind of question he is there for me. How and why did you transition from competitor to organizer? Well last year my roommate Kushal Puodel and I were talking about how the Flair scene in Las Vegas died and we decide that for 2012 we are going to change that. We are going to do some little events with some bars, somehow… I mean the main thing was we wanted to bring Flair back and we didn’t care what we had to do or talk to we just wanted to show the people that we are here and waiting and that time has come again to bring the show back to the bars like it used to be. So this year I contacted the U.S.B.G. which is the I.B.A. association in the states, thanks to a nice conversation that we had in poland we could make a nice deal to organize the National’s. So I moved my contacts and finally got to talk to William Hinkebein from Finest Call and he really helped me out to make my dream come true of making a national in Las Vegas. Now here I am, I learn how to work with both worlds competing and organizing and I think is not to bad at all. Still fun but you just don’t have that chance to compete when you are organizing. What are the major differences between the two? One is more stressful than the other one. Dealing with sponsors is not easy at all and dealing with competitors needs and complaints at the end of the event… it makes you feel like everything went bad when actually it wasn’t. It’s just you as a organizer, you want everything perfect Now competing is just hours of practice and concentration. Why is it important to you to help bring back Flair Bartending Comps to Las Vegas? First because that’s the main reason why I moved here. 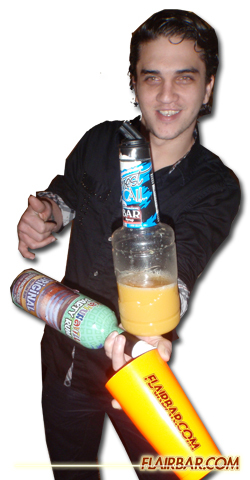 Second, its the entertainment city… how are we not going to have the best Flair bartenders in the world competing? Third, its what I do for a living. Any future events coming up? Yes, Kahunaville Party Bar, Kahunaville Party Rum and myself are organizing something nice for the Nightclub & Bar Show convention week. It probably will be the same day of the convention only during the night… And the I.B.A. National’s for sure. Any tips for other bartenders wanting to start organizing bartending competitions? First you have to stop thinking that you are a rockstar as a Flair bartender!! Why is this? because most of us think that we can charge and manage sponsors as we want and honestly it’s not like that, that’s why everything fell down. Right now mixology competitions pay more than Flair bartending events… how come? when we put much more time in what we do…? Well that’s what we get. Always be respectful to the sponsors and the most important thing TRANSPARENT with everyone!!!! Be clear and objective in what you do this way you won’t have problems with any competitor or sponsor and try always to go step by step with the sponsorship money, this will help you to have control of the whole budget at all times. My last advice, don’t expect to make everyone happy because honestly its not going to happen. In your opinion, what makes a good bartender? Dedication, Passion, Pride, Discipline and always have to have good charisma. 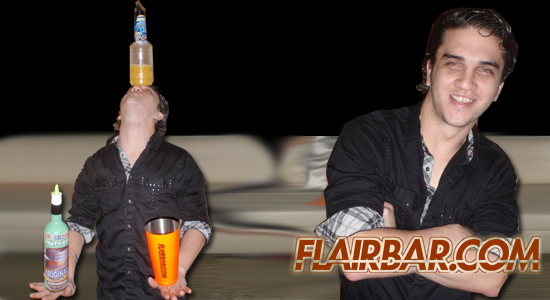 Do you think our sport of Flair bartending is on the rise or decline and why? In my opinion its on the rise.The bad economy a couple of years back really hit us bad as many other’s, Now its on us to show the sponsors again why they should put money in our events again and hire us. Of course we need more competitors, more fans, more marketing in what we do… but obviously that takes time and money. So that will come eventually. What are the advantages and disadvantages of being a Flair bartender rather then a regular bartender? Well the advantage of being a Flair bartender besides a regular bartender… I think of course sometimes the money or as well the fun that we have at the bar or maybe the chance to compete and win big money as well but the most important thing I think is the talent that you get as a person practicing this art. Now the disadvantages is we have more chances of getting fired than any other person in the world lol… we can hit a customer or break a bottle or many other things so its easier for us to get in trouble hehe.. Or maybe the matter of that we have to practice and they don’t so that sometimes is not good cause it takes time out of your schedule. Do you think being a good Flair Bartender behind the bar has to slow down your service as well? Not at all! When its busy it is time to sell but when its steady or slow its time to have some show behind the bar. Of course if you are working behind a bar which is required to do Flair at all times then it will never slow your service because the bar is made for that kind of service. What is your advice to some of the new bartenders wanting to learn Flair Bartending? Don’t do it for the money, do it because you really like it and you are pretty interested about it. In your opinion, what is Mixology? The art of mixing cocktails of your own creation or from any international cocktail recipe with appropriate garnishes and procedures of every recipe. Also for some of them having the knowledge and equipment to convert any liquid in a different material… like frozen, surpee, ice, cotton candy etc… (Molecular Mixology). Do you think Flair bartenders embrace Mixology? Absolutely!! Now its on you if you are that complete Flair bartender as I said before, not all of them practice mixology and Flair. 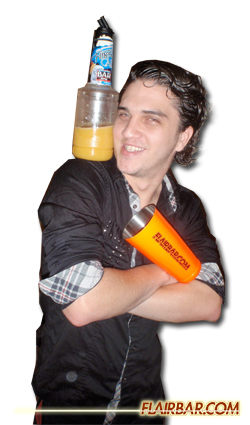 Do you think Mixologists embrace Flair bartending? No exactly!! Most of them focus themselves in creating and innovating new cocktails and garnishes with new spirits in the market and fruits or bitters. With the newer generation of mixologists as well as least 40% of them were Flair bartenders before, so there will always be something that connects Flair bartenders with mixology. Tell us about your involvement with the recent Kahunaville Flair Tropic? OMG!! I Had so much fun and Kahunaville Party Rum is so happy right now as well the owner of Kahunaville Party Bar Mark Green. He is the one that wants to do another event in the week of Nightclub & Bar Show lol, But Honestly it was amazing a lot of people came down and the competitors were all great so I can’t complain. What were your overall thoughts on the event? I think everything went great and the competitors went home all happy so really no regrets overall. Tell us about Kahunaville Party Rum? It’s some great people to work for… They are always interested in putting Flair with their rum. The people that work for the rum are pretty amazing so all I can say is that they are working together with Flair and many things are going to come in the future with them so be ready! Why should someone compete in this event in the future? Its a different experience and you get the chance to compete right next to the best in the states and as well you get the chance to meet and learn a little bit from a new line of rum. 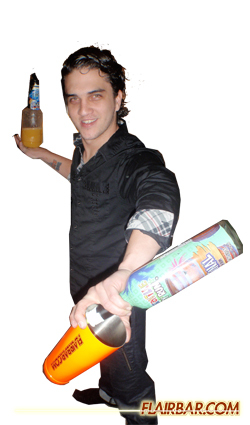 What is the secret to getting a great bartending job in Las Vegas? First getting your work cards then have nice charisma behind the bar. 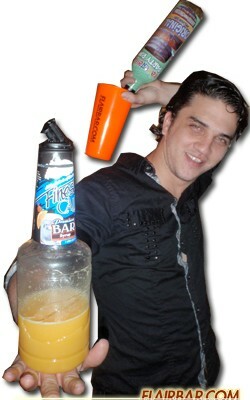 In your opinion, what are the deciding factors that make a “World Champion” Flair Bartender? His knowledge in the profession and the discipline he puts practicing. What obstacles do you see our sport of Flair Bartending encountering in the near future and in your opinion, how can we overcome them? I think Flair should be on T.V. all ready and this is not going to happen until we start working with non-alcoholic products cause obviously alcohol can’t be fully showcased on the T.V. Channel’s. Are there different avenues for sponsorship that we should pursue? Of course there are many companies around the world that want to enter to the states to support Flair but not everyone have the time to run a brand by itself especially when no one knows it. I will say Kahunaville Party Rum wants to be part of this art so why not welcome them a little bit more? Do you think corporations and sponsors investing in Flair bartenders is an effective way to promote and educate their products and why? It’s an amazing way to do it, just how you promote Flair behind your bar! you can’t just put a Flair bartender behind the bar and expect to make your brand famous… it takes time and marketing and of course you have to find the right people that can work this out. What are your thoughts on Finest Call products and Why? Finest Call is one of the greatest non-alcoholic products in the world and as well a big sponsor product of Flair. Most important is that their products are unique because all of the fruits that they used for the products are specially chosen to make that flavor in particular. What is your favorite Absolut Vodka flavor? 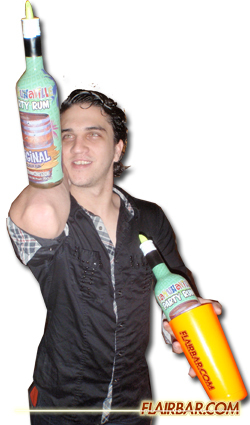 Absolut Acai. What is your favorite drink? Singapore Sling!! And if you drink it in singapore you will remember my name. Cheers.